Ralf Schneider, assistant professor of industrial and interaction design in the College of Visual and Performing Arts’ School of Design, won “Best Use of Autodesk Fusion 360” for his project Bench32 in the Cradle to Cradle Product Design Challenge VI sponsored by the Cradle to Cradle Products Innovation Institute. The Cradle to Cradle challenge invited designers, sustainability professionals and students to re-envision and redesign products for the circular economy in accordance with the Cradle to Cradle Certified product standard, a mark that validates a manufacturer’s ongoing commitment to sustainability and to their communities. The challenge also asked that Cradle to Cradle Certified materials be used where possible. More than 150 designers from 17 different countries worked both independently or collaboratively in teams to submit 92 entries for the challenge. Fusion 360 is a 3D computer-aided design (CAD), computer-aided manufacturing (CAM) and computer-aided engineering (CAE) tool that connects the entire product development process in a single cloud-based platform. 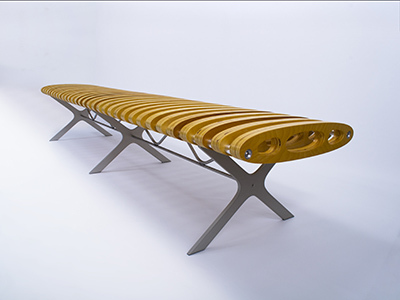 Schneider was recognized for his “brilliant” use of Fusion 360’s simulation capabilities to both ideate and render the design of Bench32, which is inspired by the imperative weight reduction in airplane construction. The repetition of 32 wooden spars forms the seating surface, which is held together by 80 metal parts. Reusing parts multiple times and aligning the elements with ample negative space creates a lightweight appearance that results in an extremely sturdy yet lightweight bench comprised of FSC-certified wood or Cradle to Cradle Certified Accoya wood. “The designers who participated in this challenge–and the winning projects–reflect a keen awareness of the need to employ safe, healthy materials in the innovation of products that contribute positively to an economy driven by regenerative design,” says Lewis Perkins, president of the Cradle to Cradle Products Innovation Institute. As a designer and design educator, Schneider offers combined European and American design values and is interested in solving complex problems with interdisciplinary teams. His current research focuses on factors that influence creativity, as well as design technology.